Trophic roles in lotic ecosystems are a reflection of the variety of basal resources, including various primary producers and categories of dead organic matter, the complicated role of microorganisms, and the diverse morphological and physiological mechanisms for the ingestion and assimilation of food. For invertebrates and fishes, the concepts of FFG and guild greatly aid our assessment of feeding roles by adding the "where" and the "how" to the "what" of resource consumption. Recent advances in micro-bial ecology have greatly improved our understanding of the ways that bacteria and fungi act as consumers of POM and DOM and synergistically within biofilms, and at the same time are, in essence, basal resources to many consumers. Production by bacteria and fungi converts POM and DOM into microbial tissue available not only to the meiofauna, but to macroinverte-brates as well. The permanent and temporary meiofauna are suspension feeders or browsers feeding on bacteria and biofilm-coated FPOM. Because of the small size of the meiofauna, it has been speculated that microbial production, especially by bacteria and in biofilms, would have to pass through many food chain links before reaching macroinvertebrates, and so much energy would be dissipated with each step that little energy would reach higher trophic levels. Under this scenario, the microbial food web is a sink for C transfer, although still important in remineralizing C and nutrients. However, bacterial production has been shown to reach virtually all consumers including fish, almost certainly due to the consumption of biofilms associated with larger particles. Bacteria associated with surfaces and within organic sediments are the most likely candidates for this pathway, although some bacterial ingestion in association with suspended POM may occur in larger rivers. 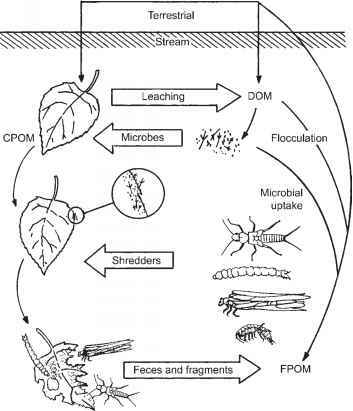 The FFGs of macroinvertebrates, categorized according to food sources and mechanism of food acquisition, reflect the four most important food resources found in streams: periphy-ton, CPOM, FPOM, and animal prey. Grazers ingest periphyton, shredders feed on CPOM, collectors feed on FPOM either from the water column or the streambed, and predators consume prey. Most suitable for late instars, FFGs provide insight into the relative importance of various basal resources. Further feeding specialization is seen to varying degrees within each of these feeding groups. Shredders vary in how they feed on CPOM, such that leaves may be skeletalized in a characteristic fashion, and also in their digestive capabilities, where crustaceans and mollusks tend to be more specialized than insects. Grazers include scrapers whose specialized mouthparts permit the removal of tightly attached algae close to the substrate, while browsers have mouthparts better suited to brushing the loose overstory of algae. A few have piercing mouthparts that allow them to imbibe cell fluids. Filter feeders have evolved elaborate food-capturing devices such as fans, nets, and setae, resulting in specialization by particle size and habitat. Detritus feeding by collector-gatherers is a common feeding mode and probably widespread in early instars; however, specialized adaptations for this feeding role have received less emphasis and perhaps are few. Invertebrate predators posess various adaptations to detect their prey, of which mechanical detection seems to be common, and can be separated into searching versus ambush hunting styles. The relationship between prey and predator body size strongly affects which prey are consumed, so that prey size and diversity typically increase with predator body size. The guilds of fishes categorize feeding roles through a combination of what is eaten and where it is consumed, such as midwater versus benthic invertivores. Relatively few fishes are herbivorous in the temperate zone, and so most members of an assemblage fall into various categories of invertivores, or are piscivores. A great deal of functional specialization can be observed in fish mouthparts, digestive capabilities, and sensory modalities for detecting prey Fishes in the tropics show high species and high functional diversity, and include many more specialists in the consumption of algae, mud, and ooze. Fish body size has an important but complicated influence on fish feeding roles. Although piscivores tend to be larger on average than their prey, the largest freshwater fishes include detritivores as well as piscivores. At least in tropical rivers, evidence suggests that predatory fishes are found in all sizes and so often are at the apex of relatively short food chains. All classes of vertebrates are represented in fluvial food webs. Salamanders may act as top predators in fishless headwaters, reptiles and birds can be important predators in some circumstances, and a surprising diversity of mammals including terrestrial taxa make opportunistic use of aquatic production, and of migrating fish in particular. Secondary production quantifies the elaboration of new biomass through growth and reproduction, after accounting for mortality, per some unit of area and time. High secondary production is due to high biomass or high population growth rates that result in high rates of biomass replacement, and so depends on temperature, resources, and all of the factors that affect the success of populations. By combining estimates of secondary production with diet studies, it is possible to connect the magnitude of consumer production to the primary or secondary production that sustains it. In the case of trout streams, it appears that consumption at the top of the chain is capable of removing all of the production below, suggesting top-down control of lower trophic levels.